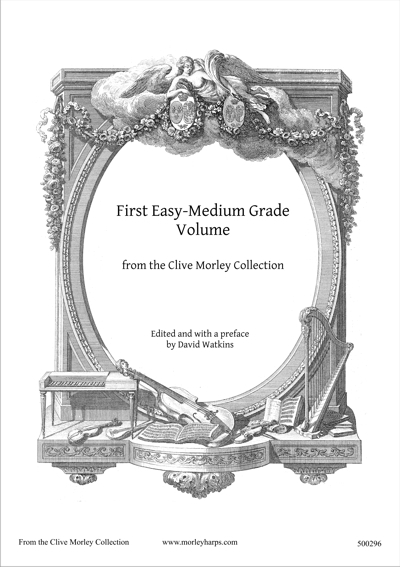 The Clive Morley Collection Easy-Med Grade Vol 1 harp book - Edited by David Watkins. Highlights from the Clive Morley Collection of harp music arranged for easy to medium grade. Henry Horn was born of German parents in Paris in 1789. He came to England at the age of ten and studied for seven years with J.B.Mayer. He became a fashionable teacher in London, wrote a popular Harp Method and promoted the new double action pedal harp. J-C Fischer was born in Fribourg in 1733 becoming the most famous oboist of the age. He was appointed as Chamber Musician to Queen Charlotte and wrote a minuet in 1780, which became all the rage. The composer, J.C.Bach, had a £5 wager with him (a lot of money in those days) that he would not be able to play his famous minuet on the oboe without stopping. Bach then sucked a lemon until the juice ran down his chin and Fischer salivated so much that he had to stop playing! 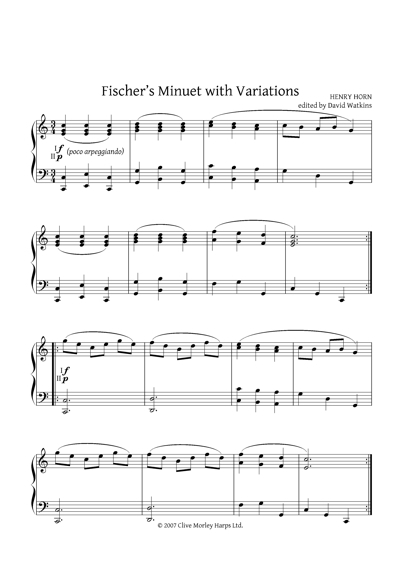 Performance Notes* This minuet and variations can be played on a lever harp with the following observation. There is time to set the F#S either between repeats or when the left hand plays only on the first beat. However, in the second variation, an A flat or natural could be substituted for the F#. This lovely andante is taken from one of Haydn's symphonies. Performance Notes* For lever harps arrange the low C# & B flat or natural in a lower octave. The Minuet is a delightful and ingenious exercise in counterpoint. Performance Notes* This can be played on the lever harp with some clever arrangement. E.g. In the sixth full bar play the second and third beats with the right hand (same in the eighth bar) etc, the left hand is free to manipulate the lever. Jean-Bernard (Jean-Baptiste) Mayer was born in Germany c.1750. He went to Paris in 1781 becoming a fashionable teacher and publishing a method and several compositions. Like many musicians, he fled the revolution and settled in London, becoming harpist to the Italian Opera. He died in 1820. His compositions are musical and intelligent. His Mozart variations (Morley Edition) are a fitting tribute to his musicianship. Except for some pedal changes this easy piece makes an extraordinary musical impact and reminds one of the poetic keyboard pieces of François Couperin. Performance Notes This piece can be played in Bb minor on the pedal harp. Three charming Waltzes - simple but very effective. Performance Notes* The second and third Waltz can be played together. These Waltzes are great for the lever harp. Mayers' arrangement of this Welsh Air is like a charming eighteenth century rondo - effective and not difficult. Performance Notes* For the lever harp: In bars 7 and 8 eliminate the grace notes. In bar 20 of the second part eliminate the C# in the left hand chord and manipulate the two C# levers before the next bar. In the second part start the grace note on the beat (Bar 2). Singer and Harpist Composer. “Lise Chantoit” and the two variations on “Ah! Vous dirai-je Maman” (Twinkle, Twinkle Little Star) are taken from his Harp Method. Performance Notes Even though this piece is in a slowish tempo, it's not really suitable for the lever harp. Version I This tune was so famous in the eighteenth century that Mozart wrote variations on it! piece is eminently suitable for playing on the lever harp. Performance Notes* For lever harps:- In the first and third variations play A natural instead of F#. We know nothing about the composer, but it is great that he left us this charming minuet in the “Galant” Style of the late eighteenth century. Performance Notes This is a SLOW Minuet and the gentle inner rhythm must shine through the piece. This Minuet was one of the most popular pieces of eighteenth century salon music. It was written by Andre Joseph Exaudet (1710-1762) a French violinist and composer. In England it was known as Count Sax's Minuet. This arrangement was made by François Petrini (1740-1820). His father was harpist to King Frederick the Great and François carried on the tradition, coming to Paris and becoming one of the most successful of harpists and composers. He taught Philippe Joseph Hinner, who became Marie-Antoinette's teacher. Many of his compositions are dedicated to her best friend, the Princess de Lamballe. Performance Notes* Petrini rather optimistically states that this Minuet is suitable for beginners. The decorations may be omitted but the way that they have been printed is an interesting insight into how late eighteenth century decorations were played. Changing the A levers will require some dexterity but can be achieved on the lever harp. When the E natural appears towards the end, I suggest playing a D natural instead. Henry Smart studied the violin with William Cramer. He made such progress that he was playing at the Opera when only fourteen years old. He was leader of the Drury Lane Theatre Orchestra from 1812-1821 and will have worked with Haydn in his early years. It is rare to find a composition of such a high standard written for the harp and which is not too difficult. It would even grace an advanced player's recital programme. Performance Notes The long scales in variation VI can be divided between the hands. All the pieces in this volume would have been played on the single action Harp. Before the end of the eighteenth century the harpsichord was the supreme keyboard instrument and was only able to produce one dynamic at a time, the loudness or softness would have been “terraced” and changes of volume or colour would be effected at the end of a phrase or repeat, when a hand would be free to manipulate a stop. At the end of the eighteenth century, when the fortepiano was being introduced, the Harp had a very important role. Haydn said that the harp really “communicated with the heart” as he was aware the instruments range of colour and dynamic contrast. So, sensitive phrasing, crescendi and decrescendi was the beginning of the progress towards the Romantic Movement. Anyone who had the good fortune to hear Nansi Richards playing the Welsh Triple Harp would have been aware of the vitality in her bass line. In a dance movement (Gavotte, Minuet etc:) the musician must make the dancer want to dance. So, a 'weighted' or stressed note in the bass is not only essential for the rhythm but can clear a previous harmonic resonance by being louder than it. (When harpists play too evenly the wash of harmony muddles the music. This is often why musicians do not like the harp!). A similar approach in the interpretation of dance movements will give life and musical interest. Any piece with * suitable for lever harps as well as pedal harps.